Take your fashion cues from The Wizard of Oz's Dorothy this Autumn/Winter with a dazzling pair of glitter booties. Miu Miu led the trend on the catwalk with their glitter and suede peep toe ankle boots that were seen on all the fashionable tootsies at the S/S12 shows. 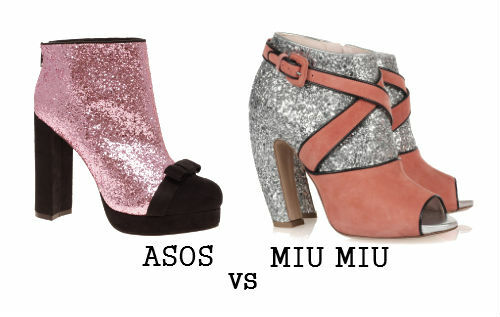 For a Miu Miu inspired style, head over to ASOS where their lovely 'Astrid' ankle boots have the designer look for a fraction of the price. The only downside? I can't guarantee that either pair will whisk you from the dancefloor to your comfy bed if you click your heels and repeat 'There's no place like home' after a hard night of partying. If only! ASOS ASTRID Glitter Ankle Boots, £65.00. Miu Miu Glitter and suede peep toe ankle boots, Net-a-porter.com, £555. haha lol if only we could be whisked away with a click of our heels indeed! Vibing this glitter trend right now but have yet to take part in it. Tempting these are though. I LOOOOOVE me some shoes! haha. Hey! Thanks for the follow and the comment :) I've been so obsessed with those Miu Miu boots for weeks now!! I like that you featured something more affordable, how great is ASOS? You blog is really chic!